We are in the midst of formally preparing for Amber's high school years by planning out her courses and credits in detail. There has been a snag: she has found too many interesting topics and subjects to study in the amount of time available. I'm not sure how we are going to nail down her curriculum when we are struggling to narrow the courses themselves. Still, we've been researching curriculum for potential courses, and have a huge wish list of items that's growing almost daily. It's a good problem to have, but we are definitely suffering from a surfeit of excellent curriculum options. We have made an honest effort to not put every last item she finds interesting on our list. Instead including only topics and curriculum we think will be of benefit while also possible to complete in the next four years. 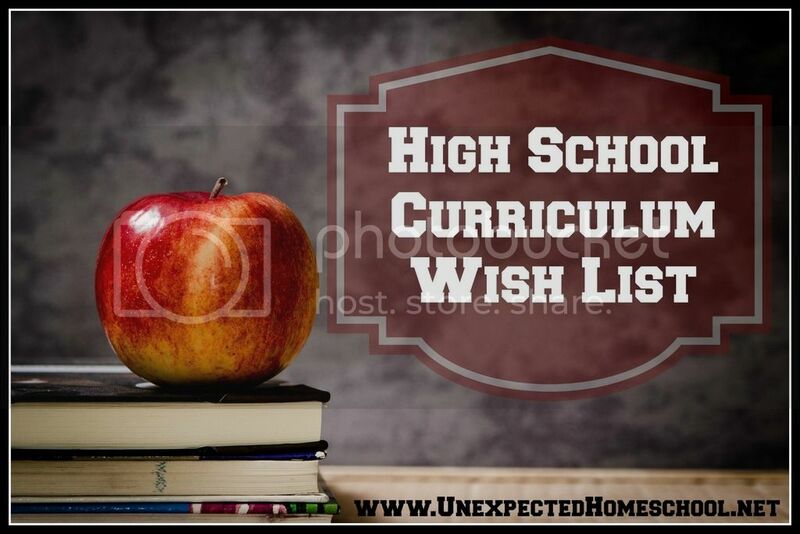 Below is our current wish list of high school curriculum, excluding what we are already using or have purchased (which is a substantial list of its own). One Year Adventure Novel - Creative Writing. Something of a must, considering this is Amber's college goal. Other Worlds - Creative Writing. This is module two of the One Year Adventure Novel. Amber desperately wants this module since it focuses on science fiction and fantasy - her favorites. SICC - C, eventually. Or maybe just level C themed writing. Fix-it! Grammar, because it looks fun. But we already have a grammar curriculum in progress that we like. Memoria Press Literature Guides: Shakespeare guides (minus Henry V, which she's already completed), the three British Poetry Anthologies. Plus the American Poetry guides we have, and the early British literature guides we have. Life of Fred Math: Geometry, Trigonometry, Calculus, Statistics... the list continues. I don't think she will have enough time for anything past Calculus. Science Shepherd Biology - Only for the genetics & creation sections. Amber isn't interested in a full year of biology. Astronomy & Astrophysics (Six Day Science / Castalia House). Amber is rather interested in this one, but I'm not sure we will have time with all the other science topics, since this is a full year curriculum. Intro to Meteorology and Astronomy, Amber is still very interested in meteorology, but I'm not sure it will make the final cut. Plus all of the other curriculum on our detailed High School Science Options Page. Tapestry of Grace: Years 1, 3, & 4. We already own year 2 and we've completed it for the dialectic level. The question here is how much of TOG do we want to complete? Just history? Or the literature, government and philosophy sections too. At least we know we will be doing IEW writing (we think). Constitutional Literacy - Amber is rather interested in this DVD series, but we can just use government from Tapestry of Grace, plus some resources we already own. Oh, the dilemma. Philosophy Adventure from Homeschool Adventure - Because we don't have any other options for philosophy, literature, or critical thinking. (Actually, we have two high school level critical thinking sets waiting already). Life of Fred: Financial Choices. So far this is the front runner for personal finance in combinations with lessons already completed. Homeschool Psych 2nd Edition. Amber still hasn't decided on her electives, but psychology has made the final cut. This one is on the wish list still. Eek! High School terrifies me. Actually my child is going into 7th next year, and that's scary as well. Looks like you have some great resources picked out though! that's a lot of great curriculum and some difficult choices! I love how she's interested in so many different things and motivated to learn as much as she can in so many areas.